I can't be the only one who has bought into the "where the hell did 2016 go" cliche, but seriously, this year has flown. 2016 will probably go down as one of the worst years the world has seen in a while, from the death of legends David Bowie and Alan Rickman (I teared up at both) and the installment of Donald J Trump in the White House, 2016 has spawned millions of memes about how unfortunate the last 12 months have been. Luckily, Christmas is on the horizon, and it has to be one of my favourite times of the year. From the lights going up on Grafton Street to the thought of spending some time at home in Galway with the family, Christmas has a way of erasing the negativity of a year and promoting positive anticipation for the next. As someone who works non-stop and lives on the opposite side of the country from my childhood home, going home to see my family for Christmas is a really important and treasured time for me. Shopping for Christmas presents can be one of the more stressful elements of this time of year, but Iv'e put together a quick 'Christmas Wishlist,' with some of the best pieces Iv'e seen recently. From 2017 planners to unusually coloured faux fur, these are my top picks for Christmas 2016. So on Wednesday morning I was up bright and early before work to pop in to the Courtney Smith X Shoe Lab collection preview. I'm sure everyone is familiar with Courtney and her amazing work, but if not, Courtney is one of Ireland's top stylists and an exceptionally talented sartorial star. The stylist worked alongside Shoe Lab designer Audrey Murray to create the capsule collection, which is comprised eight boot styles. The styles have varying 1970s musical icon influences, from the Stevies, inspired by Stevie Nicks, to the Jaggers. “It has been a dream come true, working so symbiotically with head Shoe Lab designer Audrey Murray and teaming her creative expertise with my vision" said Courtney. 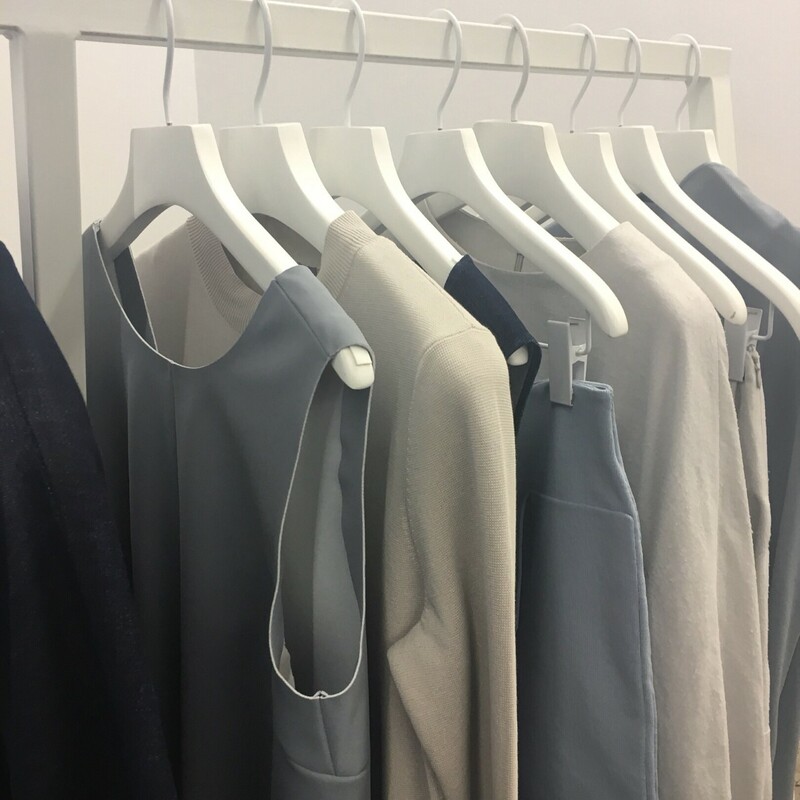 Design partner Audrey described the line as a "collection of timeless classics." The range spans from flat ankle booties to on-trend over-the-knee suede boots. As a girl who's committed to comfort, I was delighted when Courtney explained that the collection aimed to be both gorgeous and high-quality without sacrificing comfort. 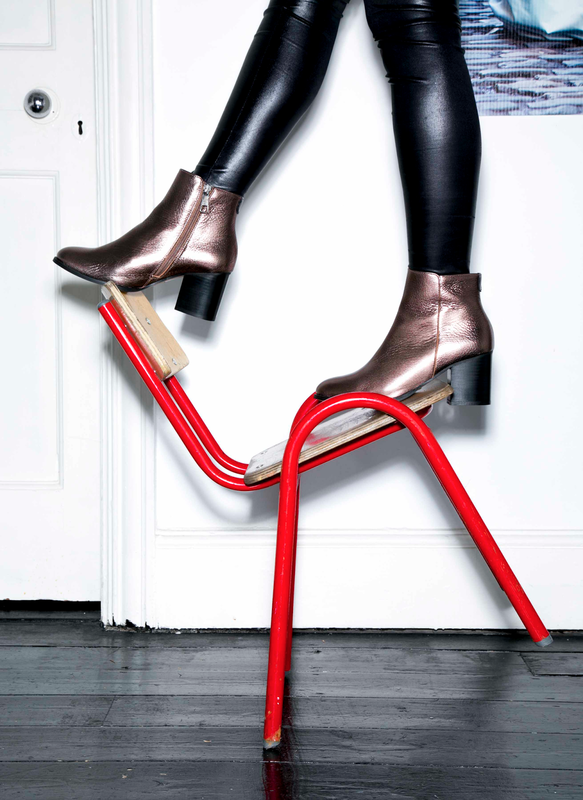 I personally loved these 'Susie Q' boots, which were styled in black or gun metal. While I usually opt for black boots, I would definitely make an exception in this case and choose the metallic, which had a subtle and edgy sheen. I also loved these western inspired boots, it's all about the little details! All of the pieces are available in Buffalo Shoe Lab on Exchequer Street, Arnotts and online. As I'm sure you've all noticed, winter is upon us, and with it for me comes a whole host of skin problems. Having the honor of being blessed with extremely sensitive, dry to combination skin, my skin's adaption to winter rarely runs smoothly. It takes issue with the return of icy, skin chapping winds and being blasted with central heating at every available opportunity, so, like a wayward teen, it inevitable throws a tantrum, usually resulting in patchy, dry skin complete with a smattering of spots. I am always trying out a new moisturizer (La Roche Posay is a personal sensitive skin savior) and new methods of brightening up my complexion. 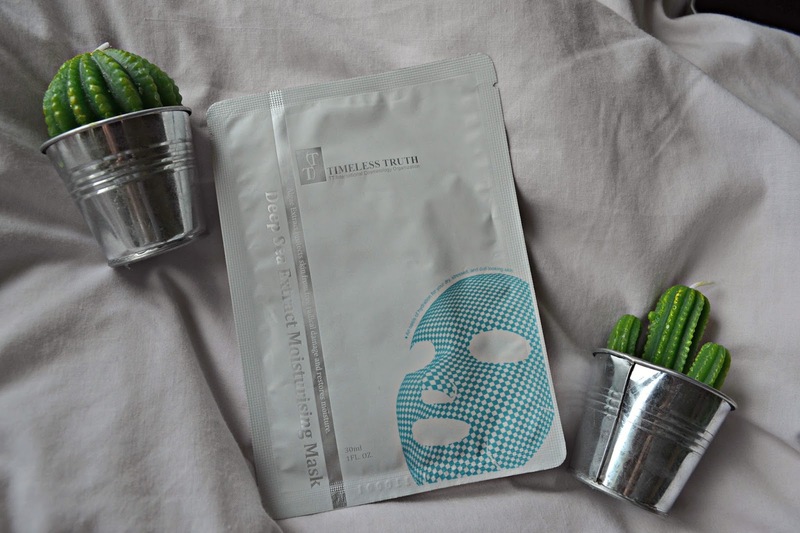 Luckily, I was contacted by Beautybelle.ie, Ireland's newest online beauty emporium which hosts a menagerie of high quality skin care products,to try out a few of their new Timeless Truth sheet masks. 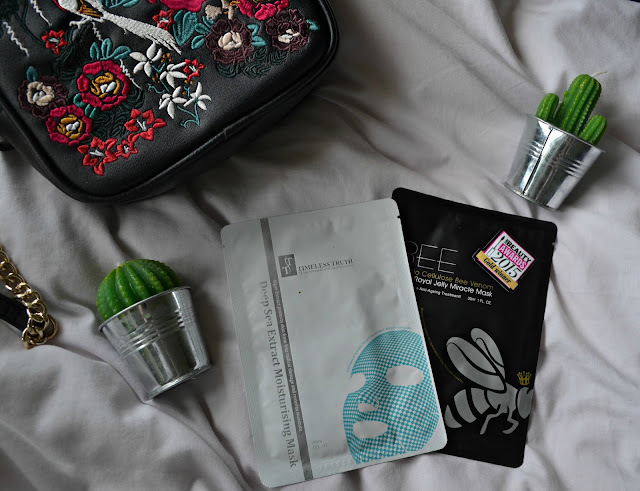 Being a lover of all things Korean beauty inspired, sheet masks are kind of my jam, so I was really looking forward to giving my skin some much deserved TLC. The first mask I tried was the Timeless Truth Deep Sea Algae Moisturising Mask. I graduated from my journalism degree this week (outfit pictures to come) and had my graduation ball to go to, so I wanted to give my skin a good drenching before the indulgent weekend. The mask smelled so nice, like jasmine, and the cotton sheet was saturated with product. I applied to to my face and settled in. My skin always stings when I apply moisturizer because it's so sensitive so I wasn't alarmed when it stung a little. I let the algae serum soak in for 20mns and peeled the sheet off, reveling plumped up and moisturized skin. Unfortunately I do have one warning about this product. The next day my skin was very irritated and my eyes were slightly swollen. I read the ingredients thourally and cursed myself when I saw the ingredient hexyl cinnamal, an ingredient I am too sensitive for. This oil is derived from a chamomile compound very similar to cinnamon(and it is closely related to cinnamaldehyde)which I'm also allergic to (yes, Christmas is a minefield) so my skin did have an adverse reaction. I have to stress that this is totally my fault as I didn't read the ingredients properly, and the initial results from the mask were excellent. Cinnamon is a very rare allergy so 99.999% of people need not worry, I just had to tell the honest tale of what happened. I'm so sorry I couldn't give you guys a proper review, but you can check out the mask for yourselves here if you'd like to give it a go. 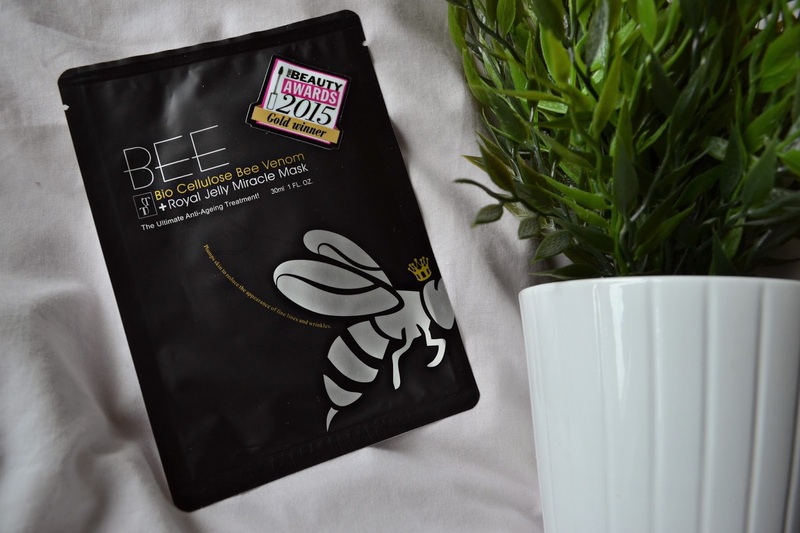 The second mask I opted to try was the one I was most excited about, the Bio Cellulose Bee Venom + Royal Jelly Miracle Mask. This mask promises to plump out the skin using the bee venom, which is touted as nature's answer to botox. This is an award winning product so I was expecting big things. The mask was very jelly-ish and felt very nourishing on the skin. I also massaged the remaining product into my skin after removing the mask as instructed. My skin felt soft straight after, but the most noticeable changes came the following day. I have some fine lines under my eyes which were visibly improved, and the red discoloration which dapples across my sensitive skin areas like chin and cheeks was basically eliminated. I think this mask is definitely suited to skin that needs a little pick-me-up, especially in the Irish winter months, when skin is battling the elements for weeks on end, and I would definitely use it again especially for treating patchiness. I want to say a massive thank you to Beautybelle.ie for collaborating with me on this post, and next time I'l be sure to read ALL the ingredients. So this is a little #OOTD post that I shot weeks ago with Ashley McDonnell of the Style Scruple when she was over from Paris. and pretty much all of this look was thrift shop bought. 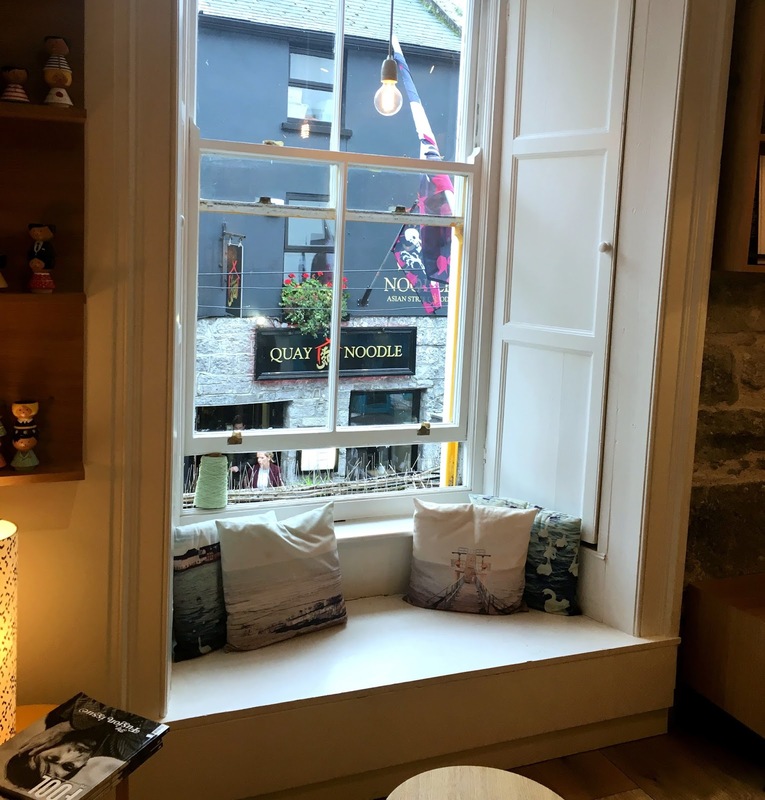 Although I live in Dublin, some of my favourite thrift or charity shops are in my home town of Galway, and I rarely miss a chance to pop in to them when visiting my old haunts. If you're in Galway and looking for a steal, my favourite has to by the Curiosity Shop on Merchants Road. I get so many amazing knitted jumpers in there (including pricey pieces from Meadows & Byrne and the Aran Mills) for a total bargain. I usually shop the men's section when thrifting because it suits my style a little more, but the women's section is a hot bed of one-off jackets and amazing retro shirts. Iv'e even found designer pieces hidden away in the store, and plenty of bits from nice high-street stores like Topshop and COS.
On my last trip found some pieces from Nine Crows Galway, all with the Nine Crows tags still attached. I know some people don't think they could find anything nice in a charity shop, but if you love alternative style and a vintage look, thrift shopping is one way to do it for a fraction of the price, while also helping the environment, so give it a try. 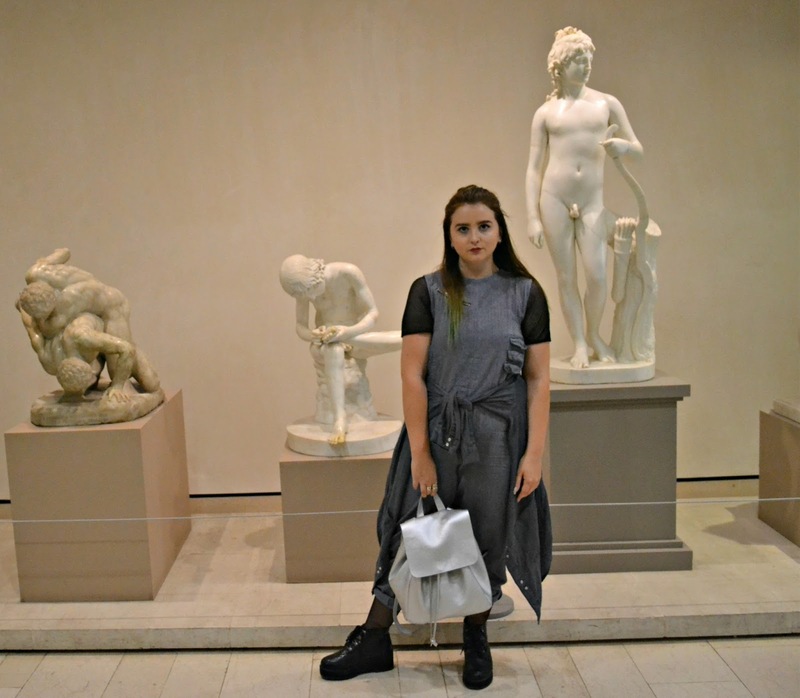 If you look back on my other outfit posts, you'l see that I'm nearly always wearing something thrifted. You can follow me on Instagram @sarahmagliocco and Twitter @sarahmagliocco for more regular outfit updates. Beauty trends come and go, usually determined by whatever Kardashian is the flavour of the month, but one beauty treatment has come to the forefront lately. Overly manicured HD Brows have had their day, and high-end eyelashes are the look du jour. As celebrities become more and more accessible through social media, it’s easier to discover the tricks of the trade that enhance their inhumanly beautiful faces and figures. Everyone has a favourite Kardashian, and mine happens to be Kylie. Even though she’s younger than me (only by two years but still), more successful than I’ll ever be and has had more work done than a high rise in the boom years, something about her look resonates with me. Blinking her doe eyes as she mimics song lyrics on Snapchat is one of Kylie’s favourite pastimes, and it was while I poured over her story one evening that I realised why her heavily shadowed eyes were so transfixing. While she clearly wasn’t wearing strip lashes, there was no way that those curly, lavishly long eyelashes were au natural. Knowing that there is not enough Juvederm in the world to give me Kylie’s look, getting eyelash extensions seemed like a pretty easy way to enhance my features, Kardashian style. However, being apprehensive about using an industrial strength glue to stick tiny pieces of hair to my eyelid (it just didn’t seem safe to me) some research was necessary before embarking on the quest for perfect lashes. 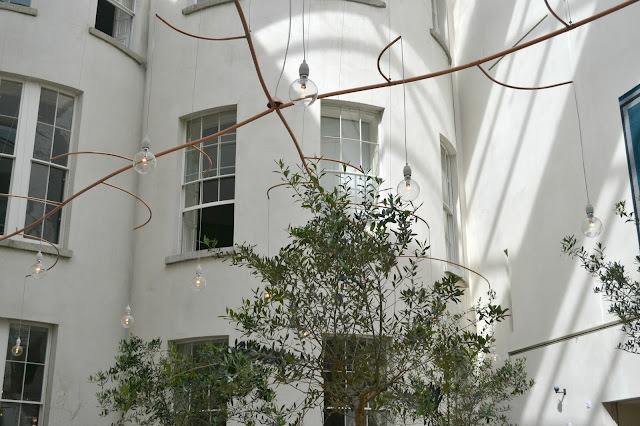 After extensive research and getting the opinions of friends who have already artificially extended their eyelashes, I opted for getting the treatment at Elysian Brows on South William Street, who very kindly invited me in to review the treatment. Prices range from €90-€120 and Elysian uses only the best mink lashes to enhance the eyes. I had a lunchtime appointment so the salon was relatively busy, and I was ushered to my chair by my lash technician. My technician explained that she wouldn’t be comfortable giving me the Kylizzle effect, as our eye shapes and natural lash textures were too different. The end effect would be too obvious if I insisted on a super curl a la Kylie. However, she could still work towards creating a similar shape while incorporating the natural curve of my eyelid and lashes, so I happily settled back and relaxed as the application began. 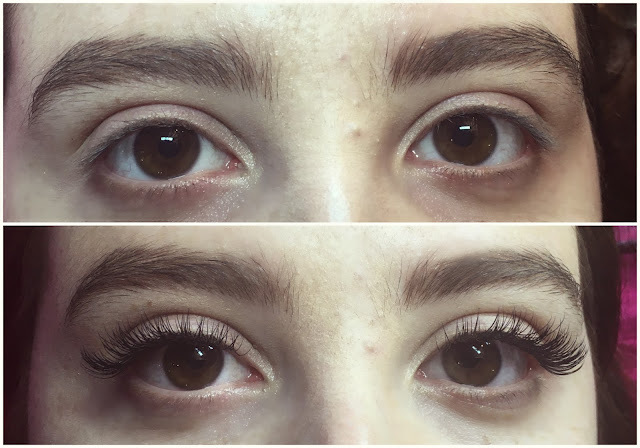 While my technician and I got chatting, she revealed that eyelash extensions have become hugely popular in recent months and that she has had to fix countless botched jobs done by unskilled techs, who promise perfect lashes for as little as thirty or forty euros. These cheap deals lead to the loss of countless lashes which may never grow back, as well as eye infections from unclean treatment areas and lashes. I also managed to get a little nap in between anecdotes, as the treatment takes a whopping 90 minutes. Upon opening my eyes, I was surprised by how light my eyelids felt. I had been expecting the heavy feeling you associate with strip lashes. The finished result was a set of long, dark and curled eyelashes, dramatic but not obvious. My eyes stung a little from the glue which made my eyes tear up but we’ll just chalk that up to me being so thrilled with my new lashes. Aftercare involves brushing your new lashes twice a day with a spoolie brush and banishing your mascara to the bottom of your makeup bag. One downside to the treatment is that upon taking off my makeup with a cotton pad that night, I was left picking bits of cotton out of my lashes for a full five minutes. Cucumber wipes are the only way to go with this one. I also had to wear goggles in the shower, as it is forbidden to get the extensions wet for the first 24 hours, but let’s not dwell on that, I am now one step closer to being Kylie Jenner. I am also now totally hooked on the treatment, and have been warned about how 'bald' my eyelids will feel whenever I stop getting them done. I had refills done in Elysian Beauty's studios about one month after the original application, and with my graduation and graduation ball coming up next week it's safe to say I'l be getting them again. Hey guys, sorry for my lack of blog posts after promising to be back for good, things have been extremely hectic as I have recently changed jobs and started a masters degree, but more about all of that in a life update post. Last night I was invited to take a little look at the brand new Alex and Ani collection, which was hosted in the Kilkenny shop in Dublin. The collection looked like it was going to be pretty amazing from the invite but it was only when I arrived at the event that I realised the extremely cool back story behind the collection. The collection consists of some key pieces, all of which feature copper accents which were created from salvaged copper from the statue of liberty itself. One of the Alex and Ani representatives told me that the inside of the statue of liberty was being refurbished during the centennial restoration, and Alex and Ani purchased the scrapped copper from the original internal structure. The copper was then purified and used in the collection to represent hope, which ties in with the brands meaningful and eco-friendly ethos. The collection features classic Alex and Ani charm bangles, cord bracelets, wrap around cuffs, classic pendants and rings. Attendees at last night's event were all given the opportunity to own a piece of the collection, and the piece I was gifted was the gorgeous cord bracelet, which will work really well with my slightly grungy aesthetic, so thank you so much Alex and Ani. All of the pieces come with a certificate of authenticity which proves that the copper comes from the statue. The event had a majorly Americana theme, with huge statue of liberty prints donning the walls and even 1950s pin-up girls performing swing songs. There was also a live art installation going on, with an artist free drawing a cityscape of the big apple, the Statue of Liberty included of course. Another aspect of the collection is the slogan #CarryLight, which while it may sound like luggage instructions, is actually encouraging people to share who or what they carry light for. Friends, family, or freddo bars, whatever you love is what you carry your light for. Follow me on Instagram of live updates of events like last nights showcase @sarahmagliocco. I recently shot one of my favorite jumpsuits in one of my favorite places in Dublin, the National Gallery. 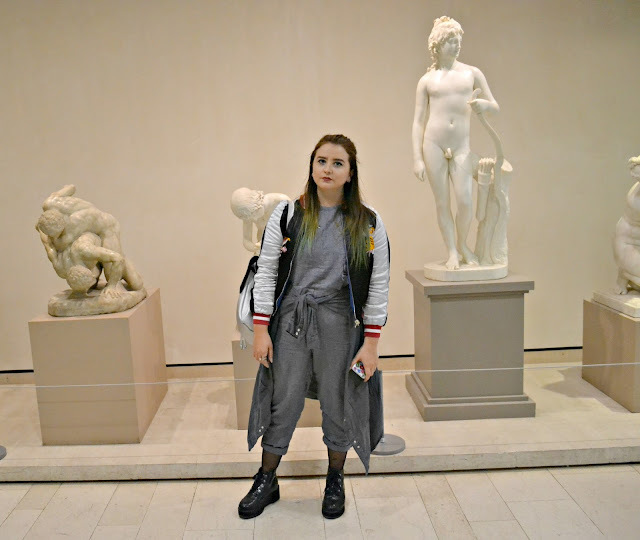 I spent last weekend wandering around both the National Gallery of Ireland but also the National Museum, and I think that a solid jumpsuit is an essential for easy city styling. 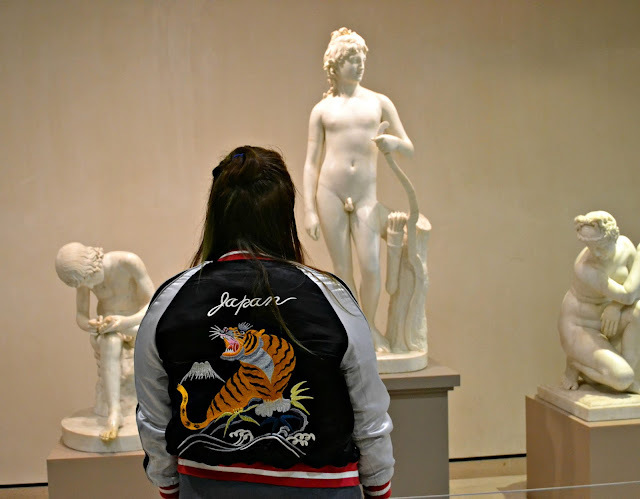 You may recall this Topshop trophy bomber from my last OOTD, but this time I've reversed it and worn the black and red side rather than the blue and white side. I definitely think that the oriental bomber jacket trend has run it's course but this is still one of my favorite pieces Iv'e bought this season. I was recently invited a little press trip to Porto to see the Parfois A/W collection (blog post on that coming right up) and they very kindly gave me so many amazing gifts, this backpack being one of them. I'ts become my staple go-to bag and it's deceptively roomy. So lately my blog has been made up of #OOTD's and mini hauls, I haven't had the chance to write a good long blog post in quite a while. Iv'e had some amazing opportunities with my internship, including sitting front row at fashion shows, heading to amazing events and getting to travel abroad to cover new collections. But because Iv'e been spending forty hours a week writing style and beauty articles at work, sometime's it's a little difficult to come home an be inspired to take up the reigns again for Vintage Venom. So to begin my return to the blogosphere, I decided I needed to start with a clean slate. I had read a few interesting articles about how good it can be for the mind and soul to take a break from social media to re-balance and recharge if you've been feeling a little down. I follow so many amazing bloggers and just amazing people in general on Instagram, Snapchat etc. and seeing what they were up to always made me a little insecure that I was slipping behind with my work on Vintage Venom. And of course seeing hot dogs or legs pictures beside an azure pool with palm trees in the background is never going to do much for the mood when you're trudging off to work in the rain at 7am. So I decided that a good social media purge was what I needed to feel refreshed and ready to get back on track with my blog with confidence and without external pressures. While I did feel creatively recharged after, I also noticed so many funny little subtlety's about myself and people around me while I was sans-Snapchat. Like there's nothing quite so strange as sitting at the head of a lunch table on a Monday afternoon looking down at the crowns of four other peoples heads all bent towards the LED screens of their smartphones. Later in the week I was going for a little run, which rarely happens, and so I felt the urge to Snapchat this major event. I mean, did you even exercise if you don't take the perfect post-workout gym selfie? And was my Sunday brunch even nice if I didn't share a picture of it on Instagram? Why do I need to let people know that I'm enjoying a weekend afternoon with great food and even greater friends? Is it to rub it in other peoples faces, that I, a 22-year-old-woman, have in fact got a social life or does it stem from a place of insecurity? I often laugh at those poor people who are like look at me, look at my cute brunch and my fancy cocktails, how fabulous am I? But I guess now I just feel sorry for them. Obviously sharing a brunch picture of a particularly aesthetically pleasing meal isn't a sin, and I will definitely be guilty of it again, but I guess taking a social media break makes you consider your motives. And this sunset. Why did I feel the need to share it in a digitally manipulable two-dimensional square, can I not just keep it as a memoir for myself? Overall I felt better about myself as a person by abandoning the like button for a while. I thought less about the imperfections I feel I have because I wasn't so constantly saturated with images of digitally-altered models and bloggers every time I slid open my lock screen, and that was an added bonus of the purge. So whats the best way to dump your social media addiction for a while and de-clutter your mood? Well, here's how I did it. First I popped all of my existing social media apps into a folder marked 'Out Of Bounds' so that even if I slipped and automatically went to check Facebook or Snapchat, I would see the folder name and remember. Then I went to my notification settings and turned off everything social media related. And that, my friends, is as simple as that. You will be more productive without the social media distractions. You will be more creative and encourage more independent thoughts as you move away from being influenced by what other people are doing. Once I had returned to social media, blinking blindly in the glossy glow of Instagram, I began to unfollow any accounts which weren't contributing to my happiness. Anyone who made me feel insecure or just contributed nothing of substance, aesthetically or otherwise, was void of my follow. Now that I'm back, I'm going to work harder on my Instagram, posting everyday to show things I love and to depict my life the way it is, not in some staged manner to make myself look great. I know so many bloggers work so hard at their Instagrams and I will too, but I always promise never to promote a brand or product I don't actually believe in myself. So take a break from social media, you may never look back. On Wednesday I was invited to the DID Fashion Show to see the amazing talent of their in-house design students. I have been waiting with baited breath for this amazing Topshop bomber jacket to arrive on my doorstep. It was kind of horrendously expensive but it's reversible (prepare to see the other side in an OOTD soon)so technically It's two jackets...justified. Photography by Ashley McDonnell of the Style Scruple. While the weather has certainly taken a turn for the worse, while the sun was shining I took a trip to the Botanic Gardens in Glasnevin. I'm definitely a bit of a plantkin enthusiast (although I struggle to keep my little Ikea cacti alive) so while the botanic gardens weren't exactly in full bloom it was still an amazing way to spend an afternoon, and shoot an #OOTD of course. I noticed that the majority of my clothes always seem to be thrifted or vintage, so I think I might put together a blog post about my favorite Irish vintage stores and thrift shops. New OOTD and workwear Look Book coming soon!